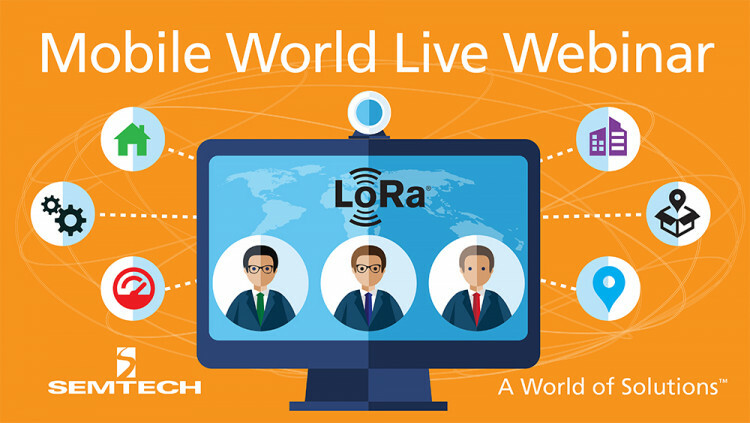 Semtech Corporation(Nasdaq:SMTC), a leading supplier of analog and mixed-signal semiconductors, today announced its LoRa® Devices and Wireless RF Technology will headline a webinar hosted by Mobile World Live, a leading B2B mobile industry news site, on Feb. 20 at 4 p.m. GMT. Semtech and two other Internet of Things (IoT) influencers will participate in a panel discussion focused on LoRa Technology’s native geolocation feature and its use cases. The webinar will include an overview of Semtech’s LoRa Wireless RF Technology for the IoT, an analysis of its geolocation feature, and a discussion about its various applications, such as smart city, logistics and supply chain management, and asset tracking. LoRa Technology features native, GPS-free geolocation capability using a hybrid mix of time stamping techniques to determine the location of sensors relative to their base stations. This allows LoRa RF Technology to offer added functionality for a variety of applications without requiring extra processing capability, increased footprint, more battery power, or expensive add-ons to the sensors. David Pringle, a writer and editor for Mobile World Live focused on the telecoms, media and technology sectors, will moderate the panel. Representing Semtech is Richard Lansdowne, Senior Director of Network System Solutions from the Company’s Wireless and Sensing Products Group. Registration to attend the webinar is now open. The webinar will be archived after the initial broadcast and be available for review on MobileWorldLive.com. Open Standard: The LoRaWAN protocol ensures interoperability among applications, IoT solution providers and telecom operators to speed adoption and deployment. To learn how LoRa enables IoT, visit Semtech’s NEW LoRa/IoT site. Download application briefs summarizing a range of use cases for LoRa Technology. All statements contained herein that are not statements of historical fact, including statements that use the words “will,” “designed to,” or other similar words or expressions, that describe Semtech Corporation’s or its management’s future plans, objectives or goals are “forward-looking statements” and are made pursuant to the Safe-Harbor provisions of the Private Securities Litigation Reform Act of 1995, as amended. Such forward-looking statements involve known and unknown risks, uncertainties and other factors that could cause the actual results of Semtech Corporation to be materially different from the historical results and/or from any future results or outcomes expressed or implied by such forward-looking statements. Such factors are further addressed in Semtech Corporation’s annual and quarterly reports, and in other documents or reports, filed with the Securities and Exchange Commission (www.sec.gov) including, without limitation, information under the captions “Management’s Discussion and Analysis of Financial Condition and Results of Operations” and “Risk Factors.” Semtech Corporation assumes no obligation to update any forward-looking statements in order to reflect events or circumstances that may arise after the date of this release, except as required by law. Semtech, the Semtech logo, and LoRa are registered trademarks or service marks, or trademarks or service marks, of Semtech Corporation and/or its affiliates. Third-party trademarks or service marks mentioned herein are the property of their respective owners.